If you are looking for a Smurf Snuggie, you actually need to be looking for the “Licensed Smurf Wrappie” because that is its official name. It looks exactly like a Snuggie (the wearable blanket that has become famous through As Seen on TV promotions). However, because of licensing restrictions, it cannot be called a “Snuggie.” We knew what you were looking for and found it anyway. They used to be available in a lot of places, but now you can pretty much only get them through eBay. Smurf pajamas are hot these days with the second Smurf movie coming out this summer (not to mention Smurf cartoon reruns almost all day long!). You can find Smurf pajamas for both adults and kids, but I am more concerned about the adult pajamas! One of my favorite places to buy them is Crazy for Bargains, but they currently do not have any in stock. Their selection changes frequently, but often they will have a couple of different pair of Pajama Pants, one with lots of Smurfs and the other with Papa Smurf. Amazon also has a varied selection of Smurf pajamas, both for men and women. They are usually sold through Amazon resellers, so products change from day to day. You’re most likely to find Ladies Sleep Shirts and Lounge Pants there right now. 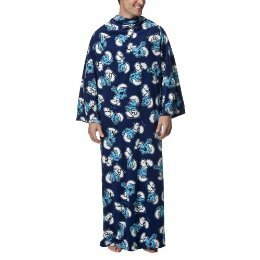 If you can’t find Smurf pajamas that you like, you might want to pick up a Smurf Snuggie. They run about $20 and would be good for adults or kids either one (although they come in adult sizes). A final good place to check is eBay. Ordinarily I wouldn’t buy clothes there, but it is a good place to try for items that are in hot demand and hard to find (like Smurf pajamas!). They have the biggest variety of any place that I have found and often they are brand new with tags on them. Check out all of the pajamas at eBay including those below. I know they are generally called “graphic novels” these days, but I still prefer “comics.” And I am happy to announce that Smurf comics are due to be released in August. Smurfs #1 Smurfnapper is a “sampler comicbook from Papercutz with a full story in anticipation of the new series of graphic novels” that will be launching soon. The two comics slated to come out in August are Smurfs GN Vol. 01: The Purple Smurf and Smurfs GN Vol. 02: The Magic Flute. You can pre-order both of the Smurf Graphic Novels from TFAW.com.